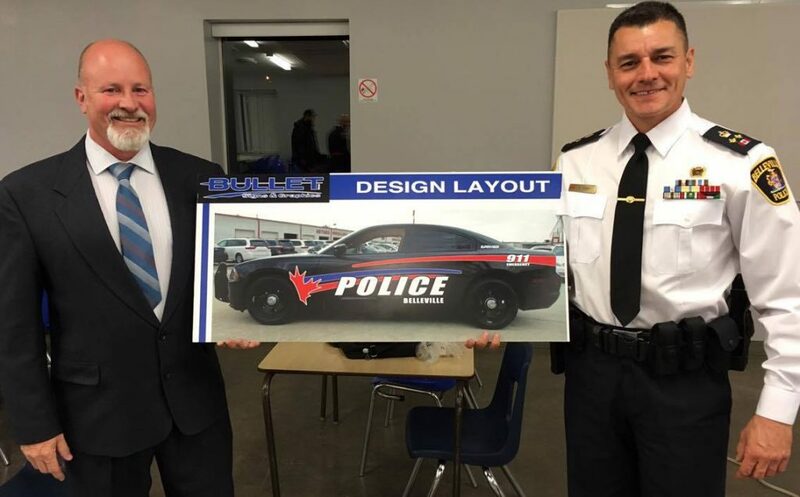 BELLEVILLE – In an effort to increase the safety and visibility of officers, Belleville police will be rebranding and upgrading their front-line service vehicles. Newly purchased cruisers will be outfitted with a black body rather than white. Chevrolet Tahoe SUVs will also gradually replace most of the Dodge Charger cars police use now. 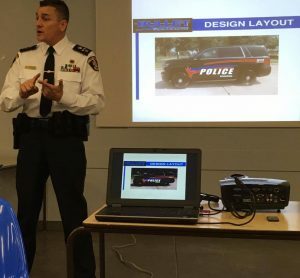 The changes were unveiled by a branding committee consisting of local officers, inspectors and fleet personnel at a public consultation meeting last Monday night at the Parkdale Community Centre. One member of the branding committee, Deputy Chief Ron Gignac, oversaw a redesign of Deep River‘s cruisers when he worked there as chief of police. Gignac said that the idea stemmed from not being noticed in traffic or while patrolling neighbourhoods. “The predominant colour on the roadway now is white, silver, subdued tones – the police cars were blending into everybody,” he said. A black car is also easier to spot in inclement weather such as snowstorms and fog, Gignac said. Annis Ross, a Belleville resident with family in Nova Scotia who attended the meeting, supported that claim. She told officers she noticed Nova Scotian car dealerships don’t often sell lighter coloured vehicles because of the climate there. 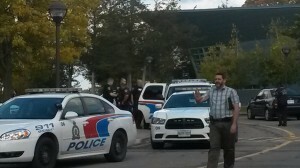 However, Halifax police and Nova Scotia RCMP do make use of white patrol cars. The new design will keep the red and blue stripes it has now, but the Belleville police crest is being exchanged for large white lettering. “We’re representing the community and I think it’s critically important to have ‘Belleville’ very, very proud and very, very loud on that vehicle,” Gignac said. All decals will be lined with new M3 reflective tape which Insp. Mike Callaghan said provides maximum vehicle visibility during roadside stops. Police say switching to a larger vehicle like the Chevrolet Tahoe will also help roadside visibility and help soften the impact of an accident. Gignac added that an increased height would also get officers in and out of their vehicle without crouching, reducing strain from carrying an average of 18 pounds of equipment. Front wheel drive vehicles are also becoming less suitable for police work, he said. Although the reception was positive from the dozen community members at Monday’s meeting, social media provided one different view. The operator of the @BellevilleDrive Twitter account, Bill Hudson, says Belleville police’s reasoning for the change isn’t as clear-cut as it should be. “All we have are anecdotes from the chief about how visible he thinks white cars are and that black ones will be seen more easily poking out from snowbanks,” he told QNet News in a Twitter message. “It just looks like it was thrown together without too much thought. Why the maple leaf? Are the curvy stripes supposed to make these cars ‘approachable’? “These cars are going to be representing Belleville for many, many years to come, so we’d better do something that looks good the first time,” Hudson said. Annis Ross’s husband, Peter Ross, also attended the meeting and said he was glad Belleville police weren’t making the same redesign mistake Toronto police had. They received public backlash after beginning a switch to grey military-style cruisers. New Belleville police undercover cruisers will be grey, however. Belleville designers Bullet Signs & Graphics overseeing the changes to the vehicles on a four-year fixed contract. Belleville police fleet manager Tom O’Leary says a cycle of replacing three or four of the department’s 12 cruisers each year is usual business to keep them in top shape. The new design will be applied as new vehicles are purchased. “It’s not going to anything above and beyond what’s happening now, and it’s completely manageable in the budget,” he said. O’Leary added that the switch to pricier Tahoes would be made cost-effective by their longevity. Police said they’ll be phasing in the SUVs as they can, eventually using their Chargers as secondary vehicles. Gignac said he welcomes any additional feedback on the changes, preferably before the end of the year.